Owning pets comes with many joys. Walking through the door and seeing your puppy wag his tail in excitement as you are tackled with love might be one of the highlights of your day. Unfortunately, with our furry friends often comes unsightly stains and less than desirable odors. You’ve tried burning candles, spraying odor killers in the air. Still you cannot seem to rid your home of that pesky pet odor. 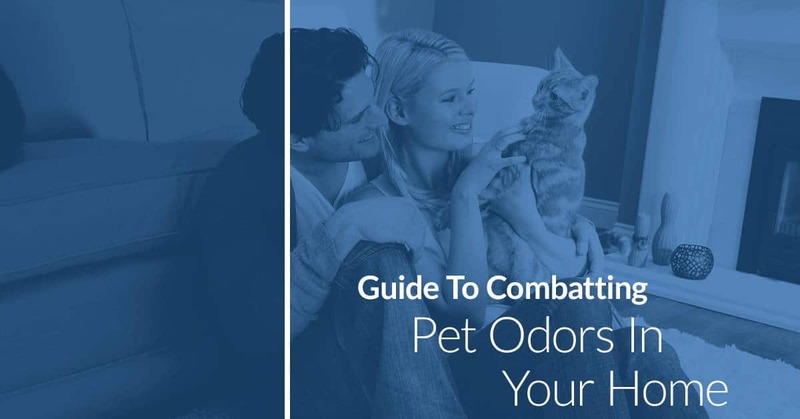 Check out our guide to combating pet odors in the home. 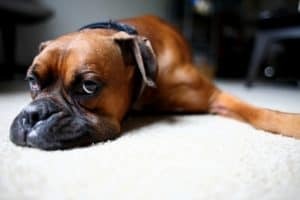 If your carpet is starting to show the wear and tear of your four legged friend, or if a pesky odor from your pet seems to persist, this post is for you. We are here to help you learn the best tactics for removing pet odors and stains from your carpet safely and effectively. One of the first things you should do to help combat the odors associated with owning pets is to clean frequently. Even if you have a pet that doesn’t seem to visibly shed much, you need to vacuum your carpets frequently. Pets not only shed their fur throughout your home, they also leave behind dander and dirt. Make it a point to vacuum carpeted rooms more than once every week. When you vacuum, don’t quickly sweep over the area. Start with one corner of the room and work your way through the room with slow motions. Focus on slowing down when you pull the vacuum back towards you as this is when the most suction occurs. Vacuum similar to the style you would mow a lawn, with straight overlapping lines. Once you have made your way through the entire room, go over it again but reverse the direction of your lines so you hit the carpet fibers from a different direction. Is your pup still learning the ropes of potty training? Do you have a cat that likes to express their disdain for you being gone all day with urine marks? It is important to treat all stains as soon as possible. You can use an over the counter solution, or make your own. A simple DIY natural solution can be made by first soaking the stain with vinegar, then adding a little baking soda. Be sure to put the vinegar down first or you’ll be reliving your elementary school science class volcano. Baking soda can also be used on a weekly basis sans the vinegar. First vacuum your carpet thoroughly. Then sprinkle baking soda across the area. With a small brush work the baking soda gently into the carpet. Let the baking soda sit for 30 minutes to an hour. Then vacuum up the baking soda. This will help pull out any grease or lingering odors. Check back soon for Part 2 removing pet odors and stains from your carpet. Use the form below to reach out for more information about our carpet cleaning services. We can help you tackle your hard to remove pet odors and stains. Another way to prevent odor build up is to ensure your furry pals are clean. Groom them frequently. Dogs who are not bathed will be more prone to shedding dander along with excessive amounts of fur. If your dog spends time outside, make sure you clean all four paws before letting your pal run around the house. During muddy seasons, keep a towel by the door to ensure you don’t wind up with dirty prints on your carpets. When was the last time you changed your HVAC filter? Although this may seem unrelated to your carpet, it can contribute to that musty dog or cat smell around the home. Your home’s air filter should be changed a few times a year. If you have noticed your allergies getting worse, it could be due to the build up of dander and fur in your HVAC system. Changing your filter is simple and cheap, but will improve the quality of your indoor air greatly. Keeping up with ongoing cleaning, including ensuring your pets are well groomed, will help a lot towards keeping your home fresh. However, if you own pets, you need to schedule regular, professional carpet cleaning on a frequent basis. 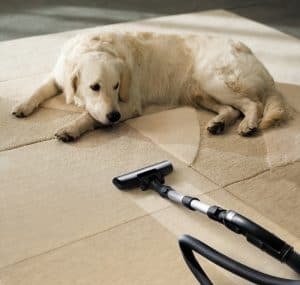 Over time, even well behaved pets who never have accidents and allow you to groom them frequently will contribute to the buildup of grime, dirt, dust, and dander in your carpet. Regular vacuuming and cleaning cannot reach the deepest parts of your carpet fibers. Steam cleaning will target the deepest parts of your carpeting, and the high powered extraction methods we use will pull out odor-inducing pet hair, dander, and urine. This will leave your home smelling fresh and looking clean. It will also improve the longevity of your carpet, which means lowered costs for you in the long run. If you have tried all the methods listed above, all the methods from Part 1 of this blog series, and your carpet still has a lingering odor, contact our technicians. We can assist you with high powered steam cleaning for your carpet.